In case you didn’t know, today – January 21 – is Squirrel Appreciation Day. 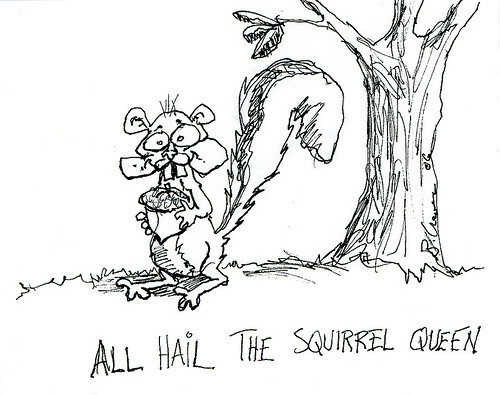 All hail the Squirrel Queen. In honor of the day, drop a few extra snacks in the park and slow down when you see one of my legion strolling in the street. Or check out these squirrels of the World Wide Web. Personally, I will seize the day. Thanks to my pal Badger for the original drawing. Inspiration is everywhere. Sometimes all you have to do is look outside your window. Photographer Paulo Pinto snapped a pic of birds on a wire. The photo ran in a newspaper. Seeing the stark contrast of the black birds against the sky, composer Jarbas Agnelli envisioned the birds as musical notes and his curiosity made him play the tune. Here’s what he saw and heard. The Daily Mail from the UK has more info on Agnelli.